Today was quite interesting and fairly productive. I went through 1981 and started on 1980 of Playthings. This period covers the rapid rise of home consoles and the shakeout of electronic handheld games. In 1979, demand soared while a chip shortage prevented manufacturers from making enough – everyone sold out, including crappy products. In 1980, there were dozens, if not hundreds, of knockoffs, and many manufacturers produced and overproduced assuming it would sell. What was worse, retailers bought all this crap without understanding what would actually sell. Buyers became more discerning, since they now had choice and there was no shortage, and as a result, retailers had to sell at closeout prices to dump bad inventory. If two stores were close together – particularly a big chain store like K Mart – and the larger store ordered too much product, they’d cut prices, and the other store would be forced to match in order to move product. As a result, many games sold either slightly above or below cost, so there was very little margin. People got burned and decried handhelds as dead. (They weren’t – manufacturers got smarter, technology improved, and the smart retailers scaled back and only purchased what was in demand.) This same boom-bust mentality appears to be the exact same thing that shook out the TV tennis market in 1977 and later the home console market in 1983. It’s also a huge missing piece of the puzzle (currently looking for more coverage of the computer game industry in this period as well as evidence of audience crossover between console, arcade, and computer). The Telstar line (standalone home TV games) ran up through 1982, with two of the more complex products. Unsure if this was back stock or they were still being manufactured. There are no Coleco games in the 1983 catalog (odd), but a two-page spread in the 1984 catalog. None in the 1985 catalog. The 1983 catalog can probably be explained away as there being a separate ColecoVision catalog, which the museum does not have. Coleco had pretty nasty ads comparing their handheld electronic football games with Mattel’s. There was only one Magnavox catalog (1977) with an order sheet. The Atari catalogs were less useful, but they had an advertising brochure that was fun to look through. Mattel’s wasn’t terribly useful, but I think they had an order sheet. There was also a DVD containing about 1 GB of PDFs with game news articles from the 1970s and early 1980s – incredibly useful for researching the Crash (or Shakeouts, as it might be better described – plural, since there was home console, handheld electronic, coin-op, and TV tennis; there was also a home computer hardware shakeout, but I don’t have any information yet on how that affected computer game developers). Aside from this, I got the chance to play two-player Computer Space in the vault. This was a new arcade game that just came in and was sitting in the front of the vault when I arrived. They were able to quickly get it running and it was available for play. I recorded some footage of playing with Tim Lapetino, who is currently at the Strong (as an independent scholar, not a fellow), photographing production art from the Atari Coin Op collection. We had a couple intense matches, and I also played the single player mode twice. 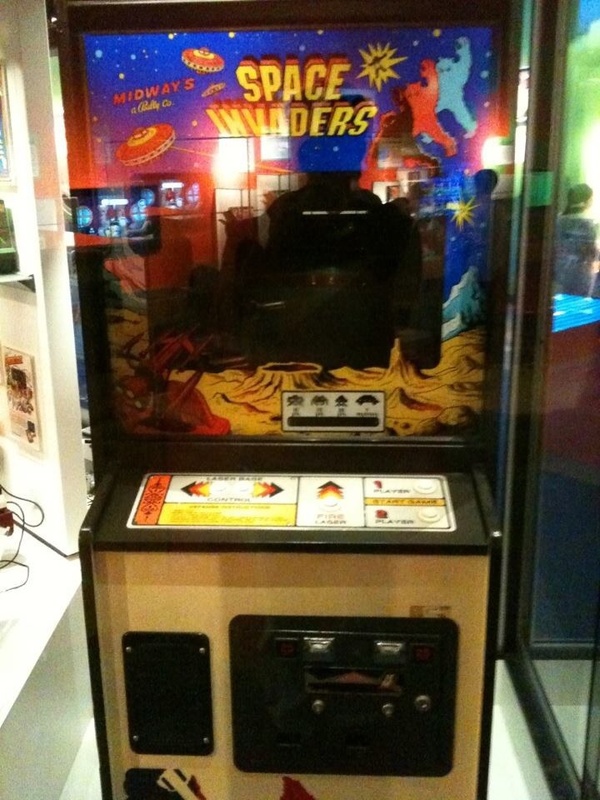 The two-player version comes in a green cabinet and has joysticks with fire buttons rather than the awkward four-button layout of the single-player version. This was not engineered by Ted Dabney and Nolan Bushnell, but rather by Steve Bristow (I think), who was working for Nutting Associates at the time. There was a contract Bushnell had to complete the game, and Bushnell made his own version while Nutting secretly commissioned another one; they chose their own. Computer Space is a very odd game. The missile is controlled by the joystick for left and right movement, so while you’re maneuvering the rocket, you’re also maneuvering the missile. So most of the time, you’re actually looking at the missile rather than the rocket. On single-player mode, the UFOs tend to cheap-shot you. If you score 10 points and more points than the UFOs, you enter ‘Hyperspace Mode’, which gives you an extra 99 seconds of play. This is just another round of play, but the white and black has been reversed, so it’s very bright and I think harder to control. But it’s a really cool bonus to give to skilled players. I can see though how difficult the game is to control and how the awkward controls – especially with the missile, let alone the button layout – would be enough to turn off players. The other thing that’s really weird is that the first player uses the RIGHT joystick rather than the left one – it’s completely reversed! Tomorrow I will go through a few rare books and more Playthings. Next week, I’ll be digging through the archives a bit more. Today’s research was rather productive. I went through the rest of 1983-1986 in Playthings and also skimmed 1987. I located the moment when videogames seem to have finally returned to toy stores – July 1986. Nintendo purchased a two-page ad, and there was also the announcement that Nintendo partnered with Worlds of Wonder to sell the NES. This isn’t to say videogames weren’t still being sold – in 1985, Atari sold 1 million 2600s – pretty impressive for a ‘dead’ system. Also, INTV was trying to sell the Intellivision II. However, fewer than about 25% of toy stores would even bother with videogames. If you look at the advertising, as well as Ron Judy’s statements, Nintendo is VERY careful to avoid ANY mention of ‘videogame’ or ‘cartridge’ – they state there is a video laser gun, a video robot, and ‘arcade-quality graphics’ (which is 100% true, since the games could also be found on the Nintendo VS and Play Choice 10!). ROB the Robot is also interesting. In 1985, the top-selling toys included robots. Further, two popular brands were Bandai’s Luv Bot and Tomy’s Omnibot – both of which look AWFULLY similar to ROB. What’s more…if you look at the bots very carefully, the ‘sad’ expression of the eyes and particularly the levitating head are both VERY similar to ET! And ET was a top license of 1983 and 1984! It’s extremely fun to come across something like this in the archive. This ROB/Omnibot/ET story just goes to show that game historians can’t be limited to JUST what’s going on in the world of games – we must look at the larger context of what is happening in the world and in the toy and electronics industries. Otherwise, we are too narrow-minded. I also dug through catalogs from Sears, JC Penny, and Montgomery Ward from 1982-1986. The museum didn’t have a few, but the findings were interesting. Sears sold videogames in 1983, but pretty much dropped the products in 1984 (they had a small computer selection). Montgomery Ward was more tenacious, selling videogames up through 1984 at extremely discounted prices. However, JC Penny didn’t carry anything except a few handhelds like Coleco’s Donkey Kong and the Game & Watch. This and reports from Playthings clearly demonstrate that videogames weren’t ‘dead’ and ‘nobody was buying’ them. Rather, plenty of people were buying (again, 1 million Atari 2600 customers in 1985), but at extremely discounted prices. This was mostly to clear out old inventory – hardly anyone was developing new games for the 2600, 5200, and ColecoVision, and Intellivision II (check those years on Mobygames). So product was available for cheap, people bought it, but the retailer made little money, the distributor didn’t make anything, and the hardware and software manufacturers didn’t make a dime either since there was little product being produced. Tomorrow, I hope to finish going through 1981 and earlier issues of Playthings (doubtful I can look at 1971 – 1981, as that’s an awful lot of shelf space, but I want to at least go back as far as 1975 to see the home TV tennis shakeout and the problems with handheld electronic games around 1980). There are also some trade catalogs. Finally, I will be looking for documents that would shed light on the home computer industry. I started going through Playthings, the trade journal of the toy industry. Videogames weren’t considered a separate thing back in the ’70s and ’80s but ended up being attached to whatever industry felt most logical – like the toy industry. Playthings’s editors did consider that maybe videogames were separate though since they didn’t count them in national toy sales data and had a section for ‘Electronic games industry’, but for the most part, since toy dealers carried the products, that’s what they were considered part of. So far, I’ve gone through 1982-1984, and the data is quite interesting. 1982 focused a lot on Pac-Man, particularly licenses, although there were lengthy sections discussing the games industry. 1983 has a lot of articles questioning the performance of videogames, with many retailers saying they won’t order product. There are some specific numbers – somewhere in the range of only about 25% were still ordering, although if that included JC Penny or Montgomery Ward I don’t know. 1984 was quite dead as far as game news – although there were some mentions of Coleco systems selling for $99. I won’t be able to go over the data in more detail until after I get back, but I saved copies of the most promising articles to my iPad for analysis. Again, I think for the researcher who wants to photocopy, using a tablet is definitely the way to go since it has a large enough screen that you can immediately review your work – just need a good way of organizing everything. I also have to keep in mind the importance of context. For instance, Pac-Man’s licensing is part of a larger ecology of licensed products and counterfeit products (mostly coming from China). Likewise, ET isn’t just a videogame, but part of a much larger licensing market for the film that suffered from product shortages. So the information is pointing to large sales related to the demand for ET and how big that actually was. (Again, 1.4 million sold is pretty huge – and it’s not like there are reports of customers returning product because they were dissatisfied – it’s the dealers, rather, since they couldn’t move what they ordered). There is also the occasional interesting tidbit, such as the reason ColecoVision only sold 500,000 units in 1982 was because that was all they manufactured by August – they were conservative. Interestingly, this same conservativism hurt their Cabbage Patch Kids line – there’s even an editorial stating that they woefully underestimated the demand! Although perhaps the toy wouldn’t have sold as much if it was more readily available…? Hopefully tomorrow I can get through 1985 and 1986, then start going backwards from 1981. I’ve also asked Tara to pull a bunch of JC Penny, Montgomery Ward, and Sears catalogs to track videogame sales. In addition to the articles specifically about videogames, Playthings DOES have reports of what’s selling from different regions of the US. These are particularly valuable, even if they don’t always talk about Atari or Coleco since it gives a pretty detailed look at what’s happening on the ground each month. Oh yeah! My photo went up on the ICHEG blog today! They also linked to this blog, so that should increase the audience outside of Facebook friends. Spent today in the archive – arrived early at 9. It’s a good 2 miles to the Strong, and it was bitter cold (this is where bringing thermal clothes and a bomber cap is important – thank LL Bean!). Since I had three rides last week, I’ve walked a total of 17 miles since last Monday and feeling great! I also found a path that’s been cleared so I’m not slipping on the ice and watching my footing – except for black ice – OUCH! I finished checking Play Meter and RePlay, so that’s it for now for coin-op trade publications. I wish I’d finished them a bit earlier, but…it takes only so long to go through a single magazine. Actually, I would have gone through even more issues, but had to cut things off at 1986, which was when the NES started to hit big. You’ve got to draw the line sometime. Read over a little bit of what I copied onto my iPad (there are duplicates on the digital camera). It’s pretty clear Steve Kent relied heavily on RePlay when writing about coin-op – the David Rosen biography sounds pretty much identical to the account in Ultimate History of Video Games. All the more reason to replace it. I also found a Gallop Poll determining how many teenagers played videogames in 1983 and 1984. It was published in 1985, so you’d think the data would be more recent… But it gives nice evidence to debunk the theory that people ‘just stopped playing games for some reason after 1982’ since there were clearly a lot of people still buying discounted games and going to arcades – just not as many as in 1981. 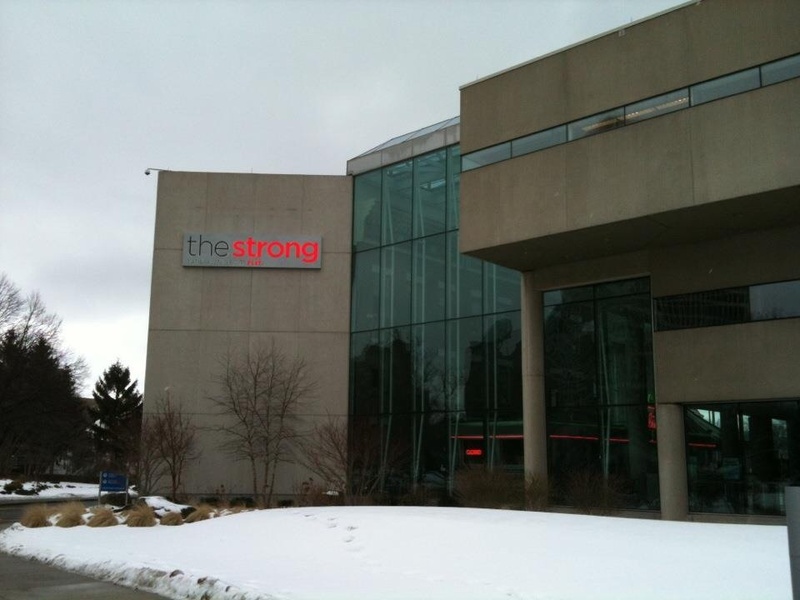 My first week at the Strong has ended, and the thing I want most of all is to GET BACK THERE and DO MORE RESEARCH! I’ve enjoyed it so much that I rarely check Facebook or e-mail while there. That’s when you KNOW you are doing something you like. I’m not held back by any need to communicate. This week was fairly successful, and I THINK I may still be on track. I went through several years of Play Meter – 1975-1987, and there are still a couple years left. This is an excellent trade publication, with good articles, in-depth interviews (including two with Nintendo’s old VP of Marketing for Coin-Op, Bill Cravens), reviews, performance charts, etc. The most valuable articles seem to be the Year in Review and State of the Industry for each particular year (in the November and December volumes). The news articles also give a detailed look at how the industry evolved – especially since for the most part, these were published bi-monthly. I started going through RePlay, another coin-op trade publication, but this one isn’t nearly as good (even if it’s edited by Eddie Adlum, who you may remember from Steve Kent’s Ultimate History of Video Games). The magazine seems focused more on jukeboxes than pinball or video (hence the name), but I think that shift past 1980 (still early on). They didn’t have another trade publication called Tilt, but I was introduced to a cool magazine by Marvel called Blip. Published in comic book format, it’s for younger kids and has no-holds-barred reviews of games (including searing critiques of ET and Pac-Man) as well as a comic of Donkey Kong and a comic of The Hulk trying to figure out how to work a Rubick’s Cube (don’t hold your breath for pics – I’m not allowed to share any b/c of the paperwork I signed). However, you might be able to Google it… August 1983 issue. The comic was produced by Stan Lee. So far, I am making sure to get things such as the cover, index, and hardware performance lists. Beyond that, I check the news and any articles dealing with video arcade performance. The articles that discuss the impact of home console games in particular are interesting, as are those that talk about the ‘crash’ or ‘shakeout’ (vocabulary differs). The Year in Review are particularly useful, as are the yearly surveys. I also like the reviews since they give a detailed look at notable vids and pins of the time – will have to analyze in more detail. JP told me Play Meter is something they’ve been collecting only over the past year or so, which explains why there are very few volumes, and what’s there is in fairly poor shape. Each year has several volumes missing – some years are missing entirely. Luckily, I’ve managed to speed up the search process. I’ve also duplicated a few promising articles on my iPad, but haven’t had time to read over them in any great detail. Again, multiple screens and multitasking would be nice on the iPad…but it’s not going to happen. Also discovered the cafeteria closes at 3:00, which sucked since I wanted a pizza about 3:30. Speaking of, it was a real pain making dinner tonight, so I’m glad I’ll have leftovers for tomorrow. Also, the walk to and from the museum is getting better – my ankles don’t hurt as much, but I wish there was much less ice on the sidewalk. I was also informed that my picture will e daken for a press release tomorrow. Pretty excited about that – they’re very professionally done. Second day in the archives was spent going through more copies of Play Meter. I looked through all the issues prior to 1982 – there is a huge chunk missing between 1977 and 1980, and there are many issues from ’80 and ’81 missing. Thankfully, there are some very useful issues in the collection, such as the December 1984 one celebrating the 10th anniversary of the magazine, and the year in reviews along with the yearly surveys are also very useful, as they list performances for the entire year as well as the top 10 news events. Coin operators were terribly spooked in 1982 about local and state legislation against coin-op games, a problem that plagued the industry since the 1930s when New York and LA banned pinballs. Due to their associations with organized crime and gambling, as well as the poor reputations of arcades, states often charge exhorbitant and unfair taxes on coin operated machines, too. So Play Meter saw this as the largest threat to the industry in 1982 – moreso than the glut of machines (particularly duplicates and clones) that caused coin op to take a serious hit in June 1982. These problems of anti-arcade legislation began around 1981 and seem to correlate with the dramatic increase in market power in that year. I also really enjoy the yearly buyer’s guides, which list the models of pinball, video game, electromechanical, jukebox, and pool tables available for purchase – often from a span of 5 yars. Each model currently on the market is listed, along with the year it wand month it was released. So this is a fantastic picture of what was available at the time. I also got to see the video transfer of the Tomorrow…Today! episode titled “Games Futurists Play”. I brought this to the attention of JP Dyson and the Strong staff. It’s a Walter Cronkite documentary. There are no videogames here, but it does cover several role-playing games (one to address the shock homeless people have upon returning to the workforce, one on running a city, and a third on communicating information and difficulty of sharing ideas). I feel it is a quite useful documentary for analyzing persuasive games and socially conscious games, as the players certainly took away useful lessons (although the “chronic homeless” game was terribly racially biased). One other thing I realized is that using a digital camera was probably not the best way of recording things. My iPad may have far less storage, but the advantage here is that I can immediately see what I take pictures of when I use my iPad, including the quality of the image – how blurry it is. With the camera, I have to wait until I plug it into a computer (not really possible until I get home). For this reason, I will use my iPad to scan articles that seem far more important, such as the 10th anniversary article summarizing the past 10 years of the coin operated industry. The biggest problem I see with the iPad though is the interface – there is no button or series of button presses that will allow you to view other software currently running as a sort of ‘tabbed browsing’ to multitask or at least quickly switch between apps. Pressing the home button, then clicking on your desired app is twice as many actions as necessary since you’re going from looking at one app to looking at your desktop to looking at another app and back. I can imagine if Steve Jobs had wanted that, he would have yelled loudly and often enough until it was done. Today was my first day in the archives. I received a Strong Fellow badge that gets me in through security and into the archive on the third floor. JP Dyson offered me a ride in, and I took the Magic: The Gathering books and Sumerian Game artifacts in for the collection (should hear back later if they want to keep all the books). First order of business was to wheel out a cart packed with Play Meter magazines. This is one of the official coin op industry journals and covers not just video and pinball games, but also jukeboxes and ‘kiddie rides’. I started with 1982 and will be checking the collection up through the end of 1985. Being an older magazine, the issues are in pretty bad shape, with pages peeling out – some issues, such as March(?) 1986, also had pages cut up! It was a little distressing to see these magazines falling apart as I flipped the pages…but on the other hand, if the pages lie perfectly flat, that makes it easier to photograph. On that note, there won’t be many more images for awhile since I’m not allowed to use images from these for anything other than research. The first things I noticed was an awful lot of coverage on movements to either regulate or outright ban coin op videogames in many laces around the US. Regulation is a prolem that affected the coin-op industry long before videogames – pinball was banned in New York and LA in the 930s and 1940s as a reaction against organized crime and to prevent ‘corruption of te youth’ – in fact, many arcades received poor reputations as being considered warrens for drugs, prostitution, gambling, and other forms of corruption. Videogames often produced the same fears. I am still unconvinced this played a major role in the collapse of arcade industry profits in 1982. The editors suggested it had more to do with purchasing large numbers of machines and thus oversaturating the market with not only duplicates of the same machine, but also clones and knockoffs. It’s kind of hard for your copy of Defender to make a profit when your competitor has two machines two blocks down the road. Sales of coin-op machines might have been up, but operator profits were down. Other interesting concerns were theft of arcade machines. Still, the editor of Play Meter did suggest that threats of regulation and legal cases against arcades was a major problem and perhaps the largest threat the industry faced. I am a bit concerned with the speed at which I go through these journals. In addition to finishing about eight issues of Play Meter, I also dug through a box of electronic games flyers, which wasn’t terribly useful, since they were from 1988-2000. JP Dyson informed me that most researchers end up rushing for the last few days to try and cram everything in. I have an incredible amunt of matrial to go through, so I can’t afford to read each article carefully and instead just photograph. That said, in order to prepare for tomorrow, I will need to bring my battery charger, as my rechargeables almost ran out. Not too concerned with photo storage though since I have a 32GB flash card, a backup 8GB card, and a 16GB USB drive. However, I can’t read anything taken off the camera unless I plug it in to a computer. In this regard, my iPad is far more useful, but just doesn’t have the capacity. Excited for what I’ll find tomorrow! Other cool findings included interviews with the presidents of Sega and Taito and Minoru Arakawa of Nintendo of America. I received a fellowship at the Strong Museum of Play in Rochester, NY. I will be here for the next three weeks researching the North American Game Industry Crash of 1983-1985. Below is my attempt to document the experience. Arrived in Rochester on Sunday. I feel it is best to arrive a day in advance of actually visiting the Strong since it gives you time to orient yourself around the city. I also think it’s good to have a free day before research so you can take a look around the museum. The first thing you’ll notice about the Strong is the architecture – it’s an odd mishmash of traditional and futuristic and playful – not exactly the most attractive building in the city, and probably constructed in several periods. Not quite sure what to make of it, coming from the Denver Art Museum. The archives were closed for MLK Day, so I spent the entirety wandering around the exhibits. 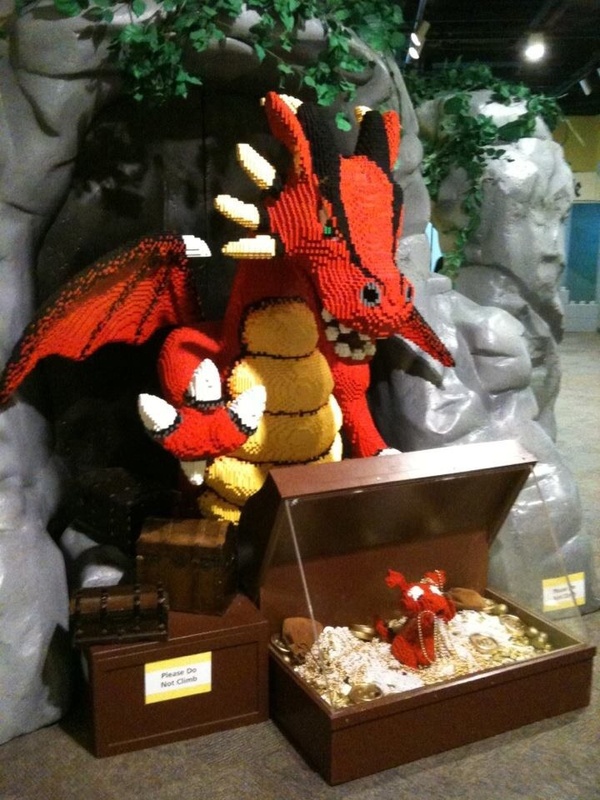 There are many fantastic interactive exhibits framing play in the context of games, toys, and exploration of the world. The first floor contains dozens of interactive exhibits for children – small toy adventure worlds that kids can climb in and explored. Many of these warranted a chuckle, particularly the Sesame Street and Story Land sections, and the noise clearly demonstrates how popular these are – at least two busloads of children arrived today. It is interesting to see how dance and song are implemented to play, from sea chanteys to Sesame Street. Some spaces are too small for an adult to reach – at least comfortably – and thus spaces such as the interior of the whaling ship give children a space that is their own. The second floor is dedicated to toys and games, primarily from the US. Some of these toys are placed in historical context through plaquards (such as Malibu Barbie and the first GI Joe), but many are simply objects of reflection placed within a context of other objects – such as large collections of dolls. Collections and collecting seems just as important to adults’ relationships with toys and play as is the original use-context. I kind of reflect on this old worn-out doll I saw in a bar recently. Everybody shied away from it because it was ‘creepy’ – her hair was completely torn out, mustache and beard drawn on her face, along with tattoos, and the half-open lips in a crazy smile. While one might be repulsed by such an image, especially to find it sitting behind one’s shoulder, it struck me that someone must have once played with and cared for this doll – an unwritten history that is now lost in its current context. Such with these toys and action figures – removed both from the original play and historical context by virtue of display. There is a large section here dedicated to videogames as well. There are dozens of arcade machines, including a few I had never played before. Tokens are 5 for $1 and feature the Strong Museum. 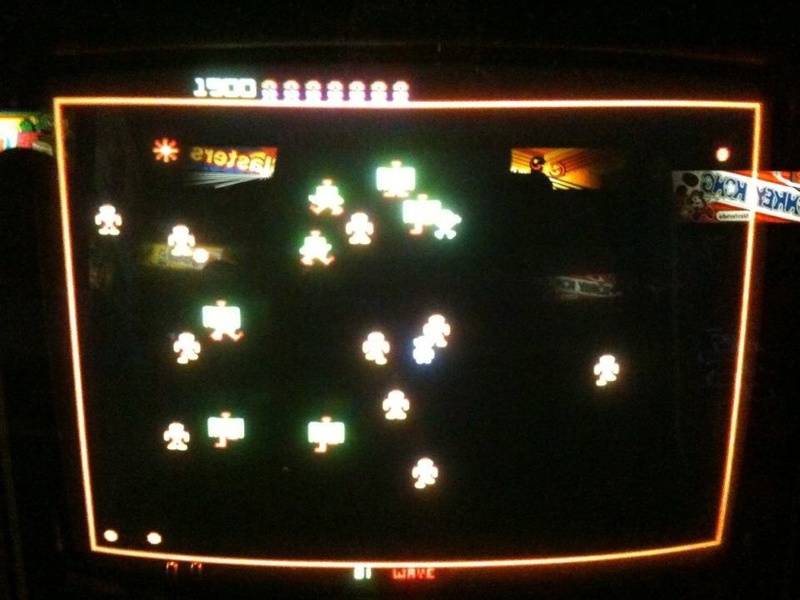 The first game I played was Robotron 2084. The settings on this must be REALLY low, since I quickly broke my score of 848,000, then 1 million, then 2 million… I decided to aim for 9,990,000 or thereabouts. Getting a score that high takes about two hours of play. It’s incredibly tiring, and I can’t imagine someone playing that high on competition settings. It was also frustrating to get up that high, only to score a few too many points and roll over back to 0. Final level was something like 399, with something like 10,500,000 points (or rather 500,000 on the scoreboard). I always kind of imagined there would be some wonderful experience, but it was actually incredibly disappointing. I spent the next three minutes wasting my 87 stored lives. Lunch was a burger from the 1950s style burger shop. The food here is pretty awful – I decided to get the BBQ burger, rootbeer float, and curly fries. I recommend NOT eating at the museum – you can pay about that much I suppose at Dinosaur BBQ, which is just a short walk from the Strong. My advice is to make the food better, but I guess like Chuck E. Cheeze, the quality food doesn’t matter. I checked out the rest of the toys and board games on the second floor and examined a few of the videogame exhibits. It was very emotional to see Brenda Romero’s Siochan Leat, along with Jerry Lawson’s badge and other artifacts. Some of these historical artifacts have plaquards describing the context, but others, such as an original Space Invaders cabinet from Midway, lack description. 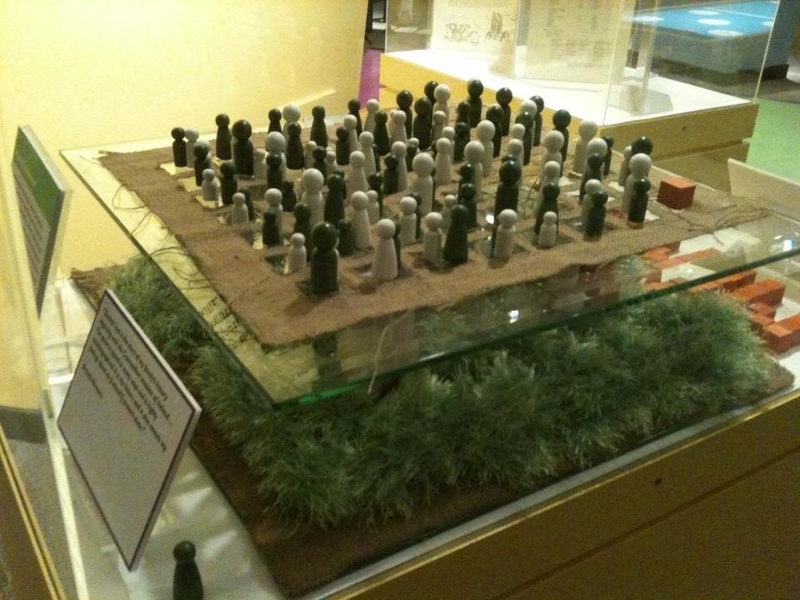 The games seem more aligned with one’s memories of play than with a historical description – why is this object here? What does it mean to the history of videogames, play, and pop culture? Does it really matter when you’re elbows-deep in Guitar Hero? I’ve pretty much spent my curiosity for the exhibits. I am sure I will ask JP Dyson and some of the other curators about this when I go to the archives tomorrow. Should be good to focus – I just wish I was a bit more invigorated, but after a good six hours in the museum on my feet (after an hour of walking from the house I’m staying at), I’m pretty exhausted. Time to head back for some potluck! Published in 1983, George Sullivan’s Screen Play: The Story of Video Games is one of the earliest books about the medium and its history. Despite its age, Screen Play contains lots of useful information for game historians, including interviews with Ralph Baer, Dona Bailey, George Kiss (Director of Sofware Development at Atari), and Ronnie Lamm (early videogame opponent).